More rain was heading toward San Diego County later Sunday evening or early Monday in the second of a one-two punch of cold, windy, winter storms to hit the area, according to the National Weather Service. Oceanside recorded .67 inches of rain from the early morning storm, which came after midnight and went by dawn. 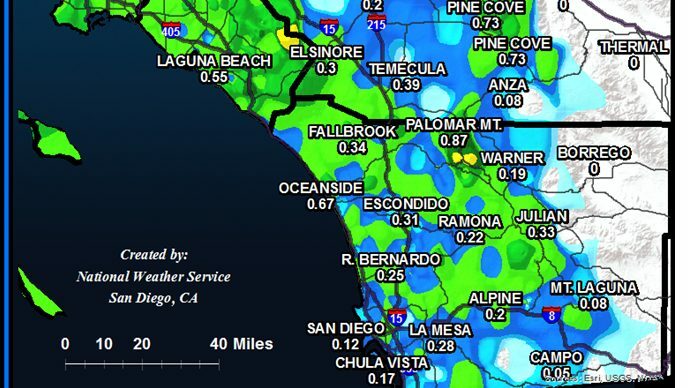 Palomar Mountain had .87 inches of rain, Julian had a third of an inch of rain, and Mt. Laguna had only .08 inches. In the city, .12 inches fell at Lindbergh Field and .17 inches in Chula Vista. A wind advisory was expected to remain in effect until Monday afternoon, with an occasional gust of 70 mph possible in some mountain passes. The next storm was expected to bring heavier rains and snow down to the 5,000-foot elevation, or maybe even lower. Warm, dry conditions were expected to return by midweek.